Enviro-Log is an eco-friendly consumer product and recycling company headquartered in Fitzgerald, Ga. Enviro-Log is the largest waxed cardboard recycler in North America and the third largest producer of manufactured firelogs in the U.S. Its firelogs are made of 100 percent recycled materials and burn cleaner than wood while providing 50% more heat per pound. 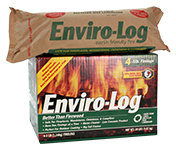 Enviro-Log Firelogs can be purchased at select national retail locations including Home Depot, Kmart, Lowes, True Value, Rite Aid, Sears, Whole Foods, Walmart, Shaw's, select Ace Hardware, Stop & Shop, Giant Foods, Fresh Market, Harris Teeter, Weis Markets, Winn-Dixie, Bi-Lo, Blain's Farm & Fleet and many regional retailers throughout the U.S.
Enviro-Log Firelogs are also available in Canada at Lowe's, Walmart, Target and Canadian Tire locations. Made from 100 percent recycled eco-friendly wax, Enviro-Log Firestarters offer an alternative to kindling, petroleum-based starter blocks, lighter fluids, and ethanol-based gels. Check it all out at Enviro-Log Firelogs on Facebook, as well as Enviro-Log Firelogs on Twitter.